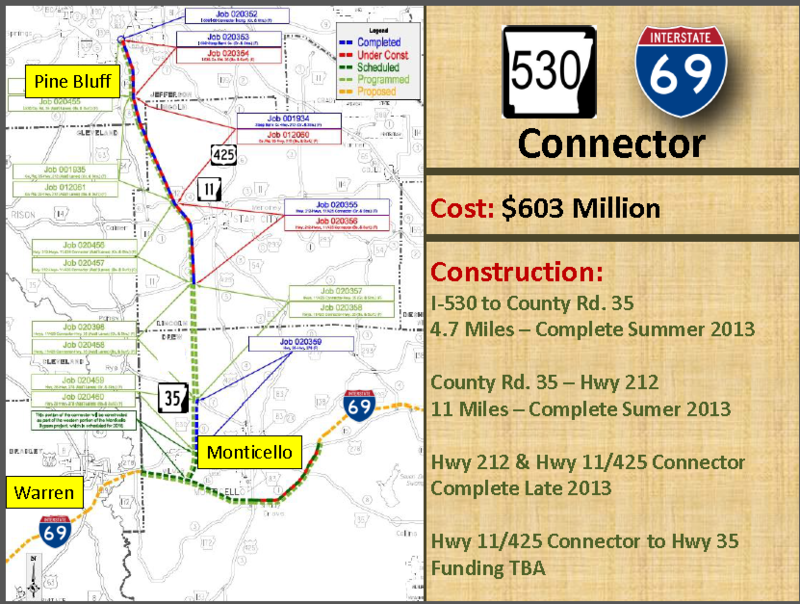 The above pdf is a little blurry, but I think it provides that the small section of AR 530 from US 278 to I-69 will be included in a 2015 western I-69 Monticello Bypass project. Is AHTD Relocating US 425 Onto the New Terrain AR 530? AHTD has posted the PowerPoint presentation for the May 21 Southeast Arkansas Cornerstone Coalition banquet. One map indicates that 15.7 miles of AR 530 from I-530 to Highway 212 should open this summer, and that another section should open by the end of the year. Motorists traveling on Interstate 530 between The Pines mall and the Olive Street/Highway 63 exit over the past several weeks undoubtedly noticed a flurry of activity in and around the new interchange with Highway 425. Danny Straessle, a spokesman with the Arkansas Highway and Transportation Department, said Thursday that the activity heralds the imminent opening of the roadway between Pine Bluff and Star City. Straessle said signage for the new roadway has already been installed on the interstate but will be covered until the road actually opens to traffic. Straessle said the next section of roadway to be constructed will extend to just past Highway 11. Is AHTD relocating US 425 onto this roadway? “Eventually Highway 425 will connect with the yet-to-be constructed Interstate 69 near Monticello,” Straessle said. Straessle said the Monticello bypass project is moving along on schedule. Straessle said that work on the western part of the bypass is not expected to begin until sometime in 2016. This was an error on the part of the newspaper. The new route will be signed State Highway 530. Highway 425 remains. We have requested a correction by the paper. An article in Friday’s Commercial misidentified the designation of the new stretch of highway between Pine Bluff and Star City that is expected to open by Labor Day. 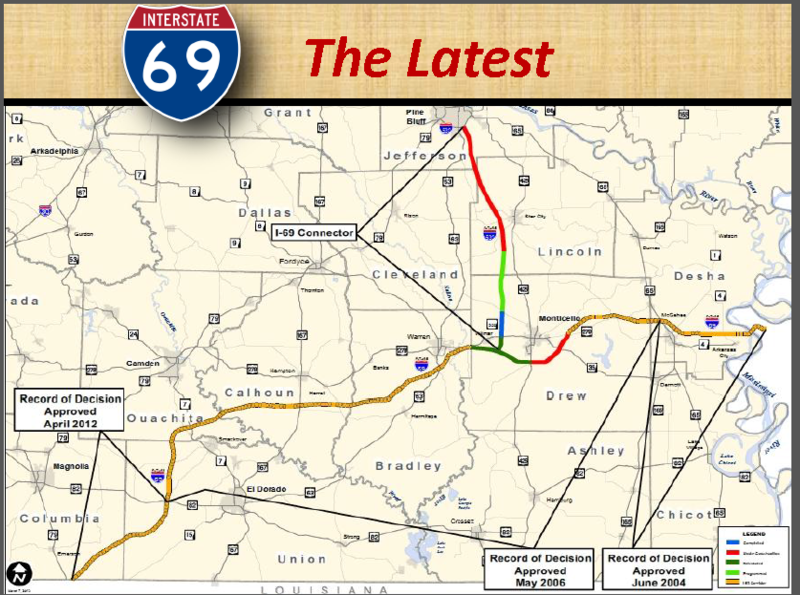 The roadway will likely be designated State Highway 530 and will serve as the future Interstate 69 Connector according to Arkansas Highway and Transportation Department spokesman Danny Straessle. Maybe the reporter became confused over comments about the 425 Connector. Too bad US-425 can't become a US-x65. Is the AR/I-530 construction on time? Completion of the I-530 connector from Pine Bluff to Highway 278 will cost around $603,000,000. The portion of Arkansas 530 dedicated Friday is 18 miles long and runs to Arkansas 114 just west of Star City. Another completed portion of the highway stretches between Arkansas 35 and U.S. 278 just west of Monticello. In 2014, a third section of the highway will be completed between Arkansas 114 and a connector road stretching from Arkansas 11 to U.S. 425. The cost of that project is $32.2 million, Highway Department officials said. Arkansas 530 is currently two lanes but will be widened as funds become available, according to the Highway Department. A completion date for the entire 38-mile highway has not been set because funds are not yet available to finish it, Highway Department spokesman Glenn Bolick said. The entire 38-mile project is estimated to cost $608 million, Bolick said. Two photos from the ribbon-cutting can be found here, one of which includes a banner describing the new road as "The I-530 Connect Road". With the removal of tarps covering road signs and barrels blocking the on- and off-ramps, crews with the Arkansas Highway and Transportation Department on Thursday morning officially opened to traffic the Exit 44 State Highway 530 interchange with Interstate 530 on the south side of Pine Bluff. The new highway extends 18 miles between Pine Bluff and the intersection with State Highway 114 in Lincoln County north of Star City according to AHTD assistant public information officer Danny Straessle. So what will the existing I-530 from the new interchange to the US 425 last exit be called? Will 530 just be dropped and US 63 and US 79 remain? US 63-65-79 are signed along with I-530 on this stretch and this stretch only, so I'm guessing the interstate designation will be removed along this stretch. No fooling around with an AR 530! that is a really shoddy attempt at '57 spec I-69. hint: it's not just the size of the numbers that is different! Wonder where the photo was taken? Most likely along I-530. There about a dozen or so Subway stores in the Pine Bluff area, so I am using Street View to try to locate the sign (note the blue space from a removed logo sign). Definitely a photo taken in Pulaski County northbound. Single digit exits are a giveaway. Looks like about noon in late spring, judging the shadows and the greenery. Trying to figure the period when Subway triplicate logo was in use. Lots of guide signs still use the triplicate Subway logo. I've been unable to find this sign either at Exit 3 or Exit 7, though the date is 2009 on the Googleview, so the signs may have been put up later. The two carriageways appear to follow different vertical alignments in the foreground. Looks like it is a southbound shot on I530 going towards the Dixon Rd exit. Doubtful. No shield on the green sign, and that looks like a centered tab. And I just noticed what appears to be an overpass in the far back of the photo. It is just a stock photo of an interstate. Not an actually image of I-69. “Straessle said the Monticello bypass project is moving along on schedule. “The current project on the eastern half of the Monticello bypass is scheduled for completion by September 2014,” Straessle said. The map from the presentation also indicates that the anticipated completion date for the current project on the eastern half of the I-69 Monticello Bypass has been pushed back from September 2014 to "Mid 2015". I'm not sure why both projects have been delayed; I had thought this past summer had been a good construction season. 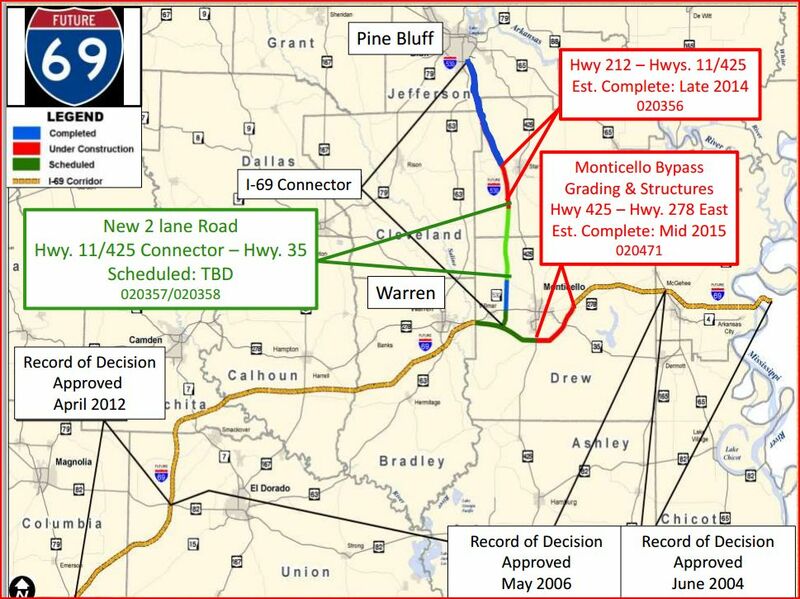 The I-69 project around Monticello shows up as US 69 as well. The iDrive Arkansas website is currently showing an estimated completion date of Late 2014 for the "US 69" project. Thank you for calling this to our attention! At this time we have removed the route marker designation to avoid any confusion. Here's what we think happened: internally we refer to this job as I-69. In fact it's the first stretch of I-69 to be constructed in Arkansas. However we can't list it on a map as such until FHWA gives approval. Our planners are in the process of reviewing this to determine how this route will be signed once the project is complete. Not sure how the U.S. Highway shield got on there either. We'll post additional information on this as it becomes available. Thanks again for pointing that out to us! I was just wondering what are the traffic counts along I-530 in Pine Bluff?